I'm having holidays from the start of next week (for three glorious weeks) which means I'm counting down the days until my release. Holidays are kind of like getting temporary parole. I'm planning to be a lady of leisure, get some tradies round to quote on jobs that need doing round the house, read books, cook and bake, eat chocolate and sew a lot. Meantime, since New Year I've been in my happy place, making minor adjustments and decor changes around Maison Pyjamas. I convinced Mr. P that he could make a 44cm x 44 cm Ikea shelf unit fit into our very thin very tall 46cm x 46 cm laundry cupboard. (even if the door space was only 42cm wide) The new shelves are a much better use of space. To his credit my amazingly talented husband put this together inside of the cupboard because that was the only way it was going to ultimately fit. Imagine if you will a man with hands the size of footballs trying to put together a shelf unit inside a cupboard. Mr. P loves a challenge and he totally rocked this one. But it was missing something...so I made some cushions. First finish for 2014 and only 7 days into the year! Can totally see myself curled up in this rocking gently while holding a cocktail in one hand and a book in the other or perhaps just cocktails in each hand. Whatever. And Ive been no slouch in the WIP arse kicking stakes either ...lots of postage stamp block progress happening here this week, with a vague thought that I may be able to make some progress on the long neglected triangle quilt while I'm on holidays too. Love your built-in shelves! What a good idea. And the chair, amazing. A wonderful start to the year. You and Mr P both rock ! Saw a cocktail posted on the internet somewhere and thought of you. I am thinking it would be just the thing for your holiday relaxing in the egg chair! What a clever bloke, well done Mr P! I lurve your chair.....the cushions suit it so well, it looks just the place to lie in and sip something cool. I wish we'd seen the wrapped version of the egg chair, wrapping huge items and making cupboards in cupboards are two impressive skills. Your holiday plans sound wonderful!! I bet your egg chair will come in handy. The holiday shadow box is a brilliant idea, yours looks fabulous! well, aren't you on a roll! I would have a wee hammer by that box in case I felt the sudden need to break in and take the money out. Save some of those WIPs for the FAL ;o) Congrats to Mr P, I have to build my own bloody furniture! Mr P is talented to say the least. That's like some weird challenge building shelves inside a cupboard! So jealous of your three weeks holiday. I just went back to work after two weeks off over Christmas and I'm ready for more already! Have a great time! Enjoy your holidays and that cool chair! Enjoy your countdown and your holiday. Right now is a horrible time at work (and volunteer jobs) for me and my countdown is about three weeks (with no holiday at the end). What a very cool chair. Holidays are wonderful for making good progress on the languishing WIP's. Love the new chair and the pretty cushions, you'll be cosy as, sitting sipping your cocktails. That is some talent MrP has putting that thing together inside the cupboard space. Enjoy all the new bits and the cocktails. Love the shelves and the chair...glad you have some sewing time! 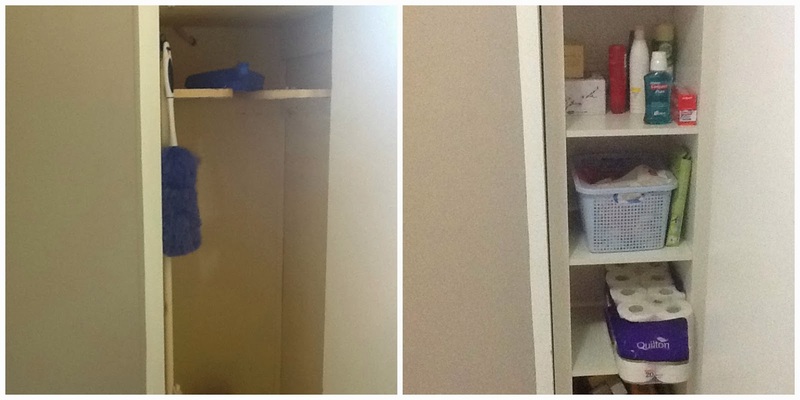 I'm very very impressed with Mr P's skills, that laundry cupboard looks so much better now. I looove your egg chair, we might be fighting over it when I come to stay! Good to see your sewing mojo is back just in time for your three weeks of relaxation. Love those cushions, they look fab. I'm not showing squid that chair because she has been wanting one of those for 2 years now. It's great having a handy husband isn't it? Now G is semi-retired, I am having great fun thinking up projects to keep him occupied in the garage. The latest is a light box. PS I think it should be a cocktail in each hand. Nasty accidents could occur if you are unbalanced in that chair! I am in awe of Mr. P's ability to set up the shelves inside the narrow closet. Love the shadow box idea. That chair is the shiz. Your cushions just make it all the more fab. Your hubby rocks at DIY and gift wrapping! Love the cushions but I think you might need some on the ground as well if you are going to drink in that chair...getting out safely might be a problem! Love the shadow box, where did you get it? Thinking that the kids could make something with them...need more distraction tools here! Postage stamp blocks are new to me, but I like the look of them, good for scraps! How small are all those pieces? Your patience is impressive! Happy sewing and bring on the holidays! Very clever to assemble inside the space! I would not have thought of that! Love this image I have of you in my head, you're bopping around maison pyjamas with a smile for three weeks! Okay, now that you have all of that work out of the way, relax and enjoy your break!!!! Cool chair! Looks like you are completely set to enjoy your holiday. Oh, to have a handy hubby! Sounds blissful! Enjoy the rest of holidays rocking in your egg chair. Hope you get a good crack at finishing some of that sewing. Cabinet looks fab - hubbys are great, aren't they? Love the chair and your funny cocktail comment.